How lucky we are as a family to still have all four grandparents enriching our lives, able to enjoy Emile & Filou growing up. It goes without saying that the kids miss their grandparents very much during this year away and it was important for us that, where possible, they join us on our world tour. So the idea came about that it would be a unique experience for all of us to have both grandfathers come at the same time! They were quickly game (my Dad ADORES Thailand and was dreaming of travelling there one more time, and Jichan just took his first trip to Japan which he LOVED, so was eager to travel to Asia again)…..and so Opa jumped on an aircraft in Düsseldorf and safely reached Bangkok via Abu Dhabi , and Jichan boarded a plane in Toronto and headed to Bangkok via Seoul. Here in the capital city, we were delighted to see our Dads and Granddad’s again! 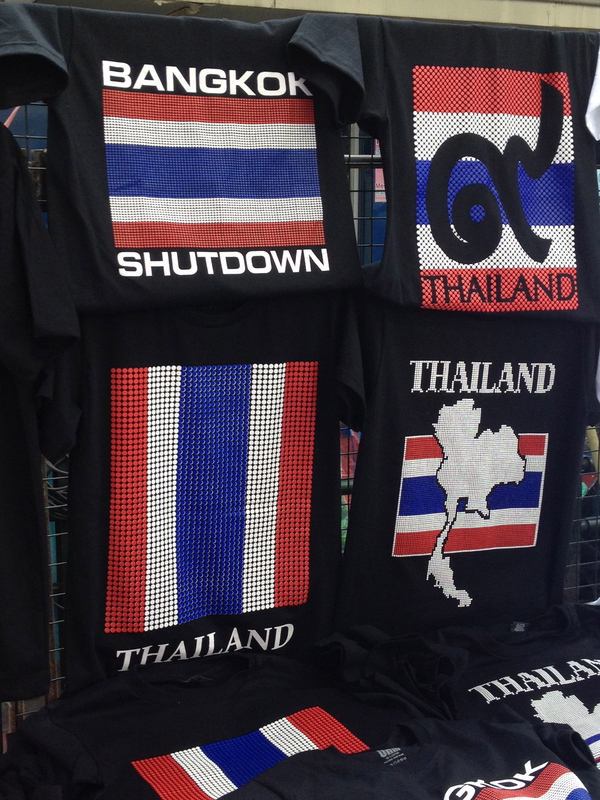 It was an interesting time to be in Bangkok. Demonstrations against Prime Minister Yingluck Shinawatra’s government and the upcoming elections in February, led opposition camps to block off the streets, and march to express their dismay about the current political situation. The Sunday we were there, two explosions and some gunshots killed 1 and injured 28 people (which is rare for the very peaceful Thai people!). We are not easily scared, and went about our way to enjoy the city. With Opa we took a nice boat tour of the Klongs (the waterways that snake through the city) during which Emile and Filou were thrilled to see a huge water monitor lizard. 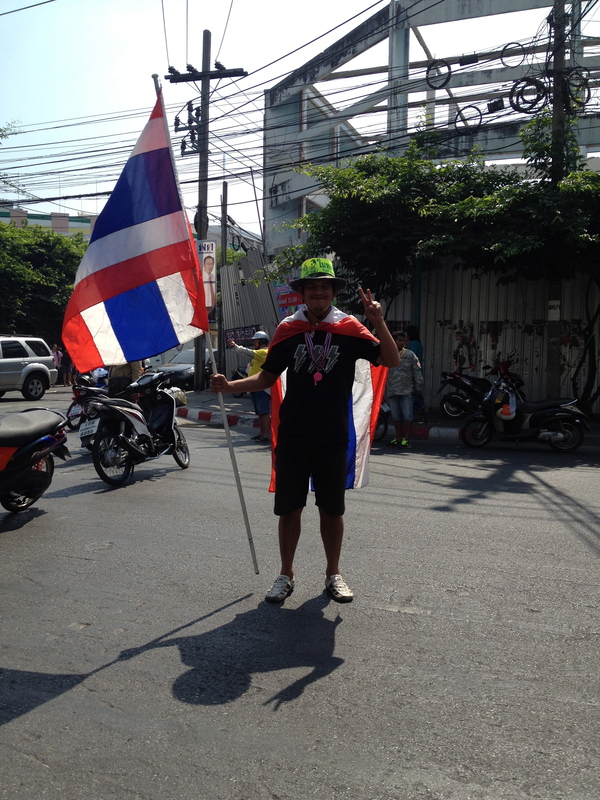 Demonstrations on the blocked streets of Bangkok. Declared “State of Emergency”! This demonstrator was all over the news the day I took his picture. He was leading the pack and near the explosions that went off. We were close to the action, for sure! And the next day, when Jichan had arrived – we all took the local mode of getting around – a transport boat that grazed the canals at high speeds (fun experience of boarding this busy vehicle that only stops several seconds to let people on and off – kudos to the granddads for joining into the jumping on and off madness! 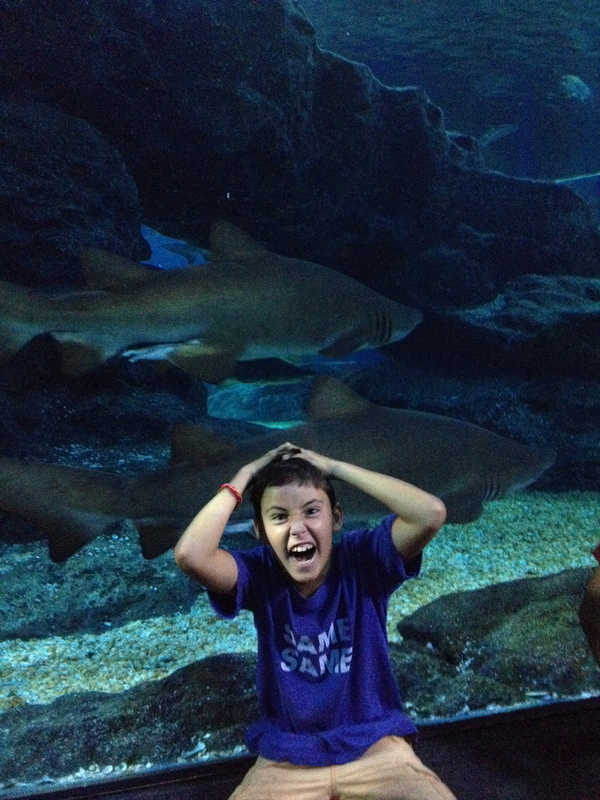 )…and went to Siam Ocean World (http://www.siamoceanworld.co.th). This stunning aquarium houses 30,000 different species and is located in the basement of the equally beautiful Siam Paragon shopping complex (http://www.siamparagon.co.th) The boys were super excited to see the many unique, aquatic species like the humongous octopus and giant crabs. 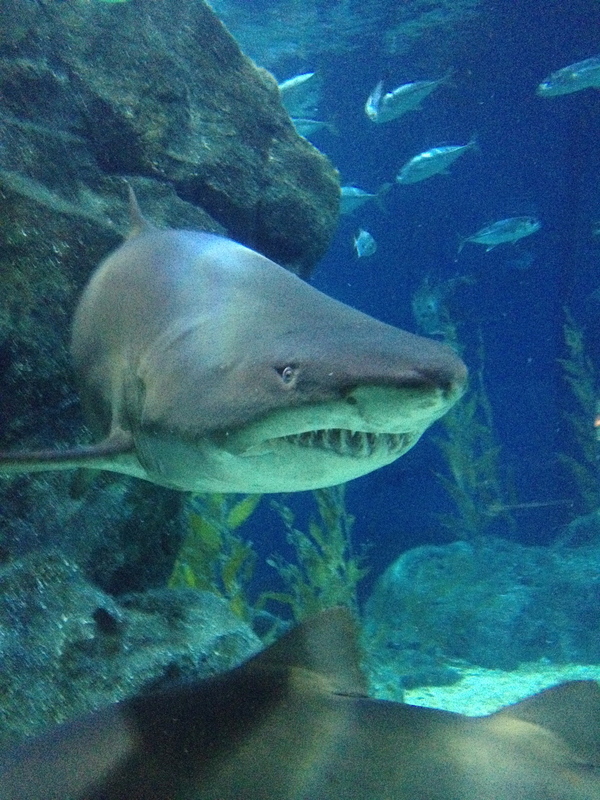 As well, the aquarium houses a 270-degree glass tunnel where the many, large sharks seemingly swim right towards you! 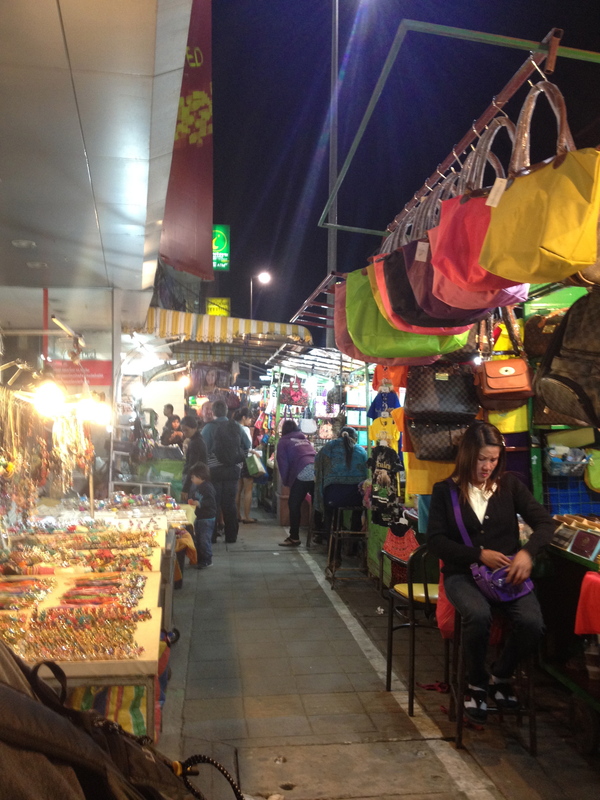 After a fun night of exploring the Bangkok local night markets and eating delicious street food – we were all happy to leave the “troubled” city and head for the northern city of Chiang Mai. 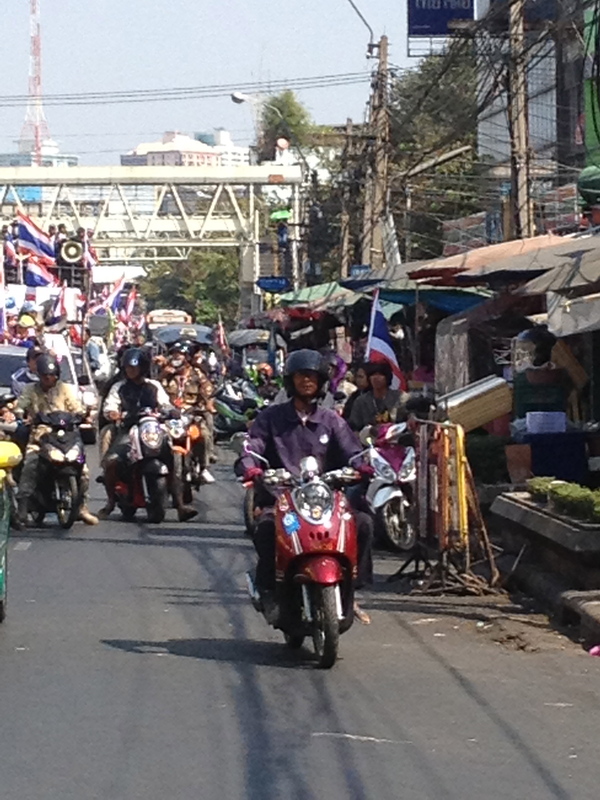 Chiang Mai or “new city” is the largest and most culturally significant city in northern Thailand. This “Rose of the North” has several hundred historic “wats” or temples, intriguing diversity among hill tribes, many cooking and massage schools, numerous elephant camps, a variety of cultural performances and fun shopping at its famous night bazaar. So, we were excited to make this city our home base for 2 weeks and stay at the lovely Villa San Pee Seua (http://www.villasanpeeseua.com). Our large, 3 bedroom, 2 level “hometown” bungalow with view over the river (at a calm location on the outskirts of the city), was the perfect place for us all. Prae, the lovely owner certainly helped at making our stay as wonderful as could be! Emile’s burning desire (he couldn’t talk about anything else for days….) 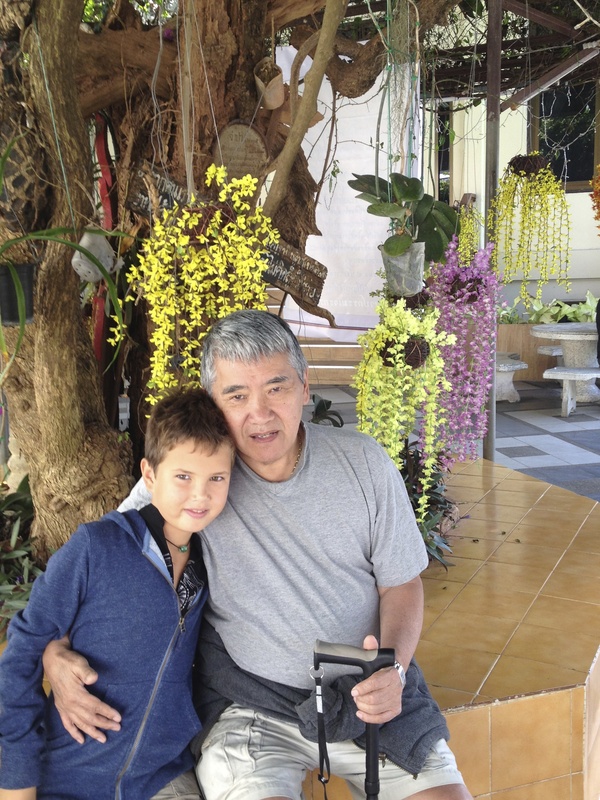 was to have a fishing trip with both his grandfathers – as each one of them has taught him some angler tricks and ignited his passion for this sport! So the three of them went off for a day of fishing with Big Game Fishing (http://biggame-fishingthailand.com) – expecting and hoping to catch some giant Mekong catfish. 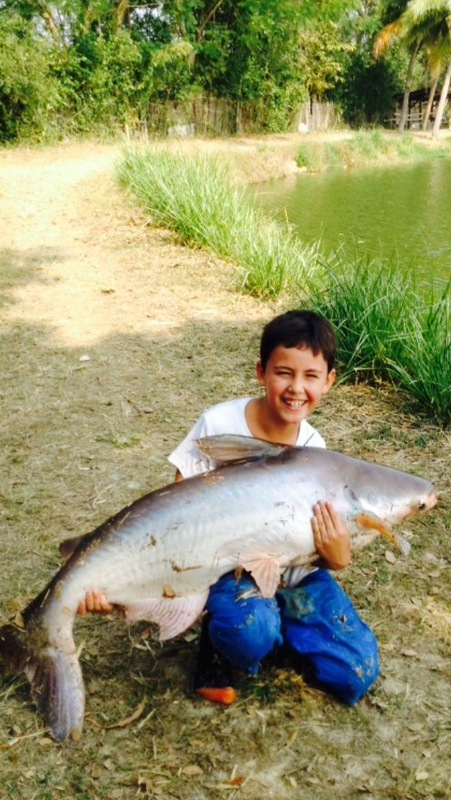 The day, guided by Suvit and his capable team members, was beyond their wildest imagination – together the boys caught a total of 130 kilos of catfish – with Emile catching the biggest one of all – a 35 Kilo/77 pounder! This fish was as big as he was… and so heavy, he could not hold it standing up. From the smile on his face, you can tell – this is not an experience that can be topped easily! 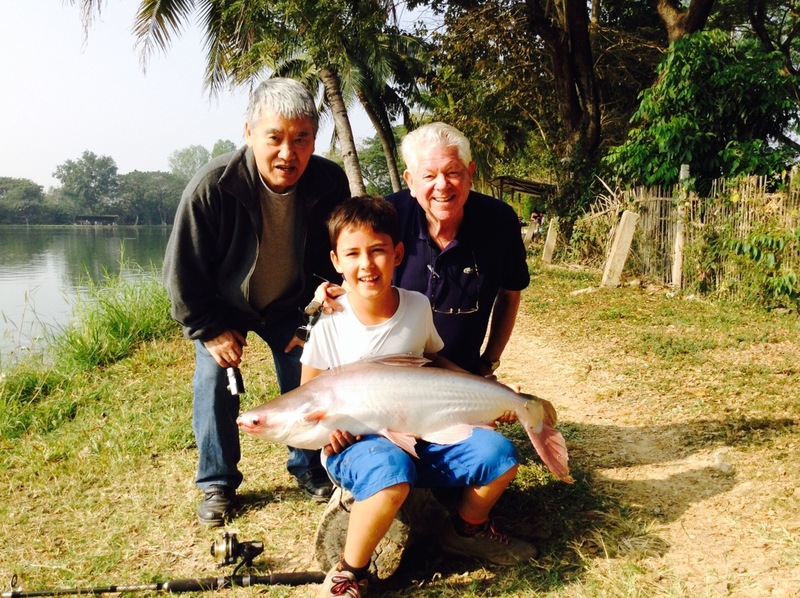 Memories for a lifetime: Emile’s dream to have a fun fishing day with both his grandfathers! After some fun times walking the colourful streets of Chiang Mai, buying souvenirs for those back home at the lively Night Bazaar and enjoying some great, local Thai massages, we set off for a day of cultural sightseeing. Wat Phra That Doi Suthep is a Theravada Buddhist temple that is still very sacred to many Thai people. 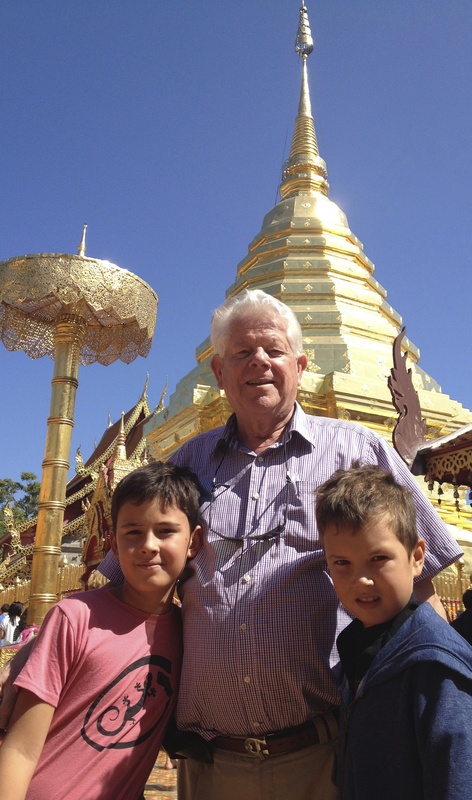 The temple is located high up on a mountain called Doi Suthep, and although getting there was less fun (the ½ hour drive on sharp, curved roads combined with gas smell, made half of us feel like vomiting for a while), it was worth getting there. At its base, we had the choice of climbing the 309 steps to reach the pagodas or take a tram (you can guess which one we chose!). Once inside the temple grounds, we took off our shoes and started to explore the site that has many pagodas, statues, bells and shrines. 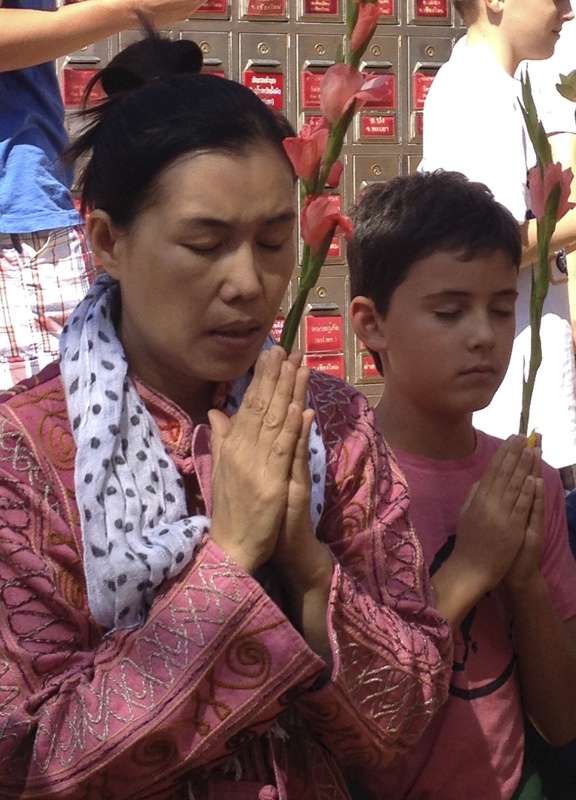 I think Emile was taken by the serenity and spiritual vibe of it all and joined the Thai women in prayer – perhaps a conversion to Buddhism is in the works? 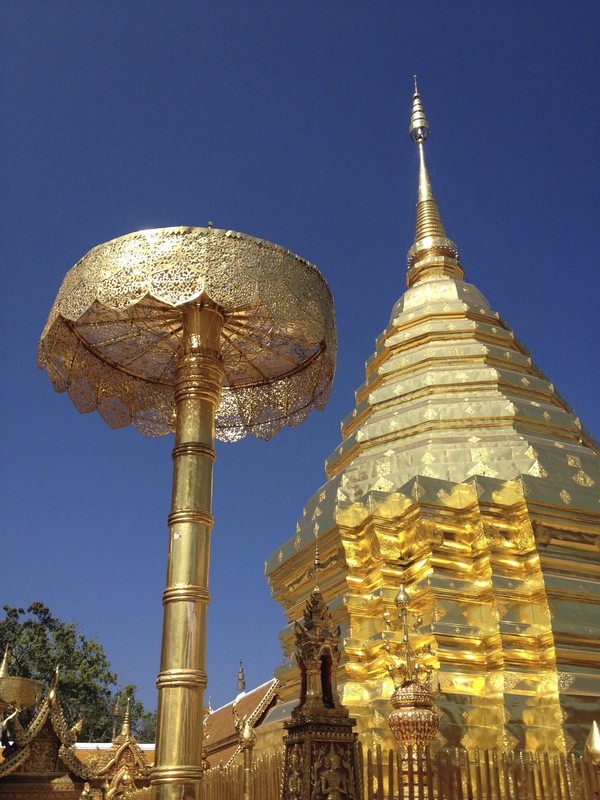 The copper plated Chedi (the most holy area of the temple grounds) – together with the five-tiered golden umbrella, were truly impressive (and shiny!). 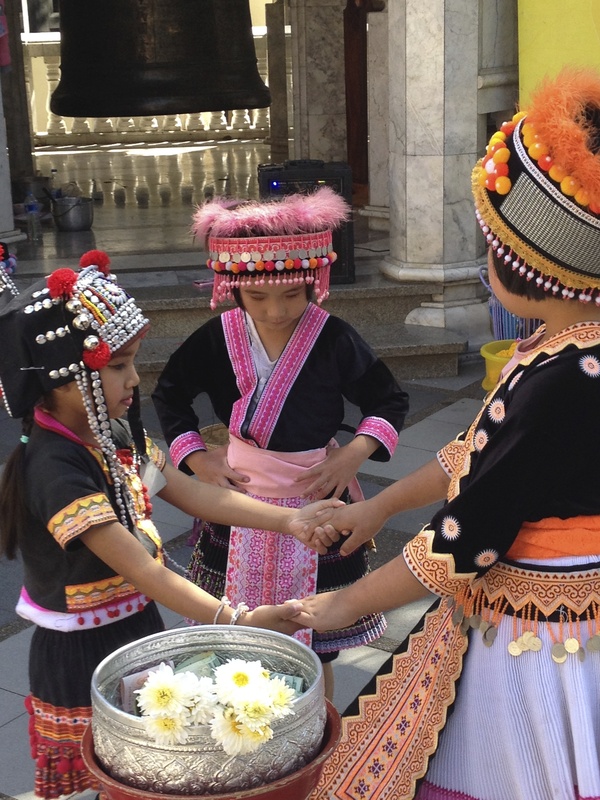 The Wat draws many Buddhist that come to serve, bring food offerings and pray. 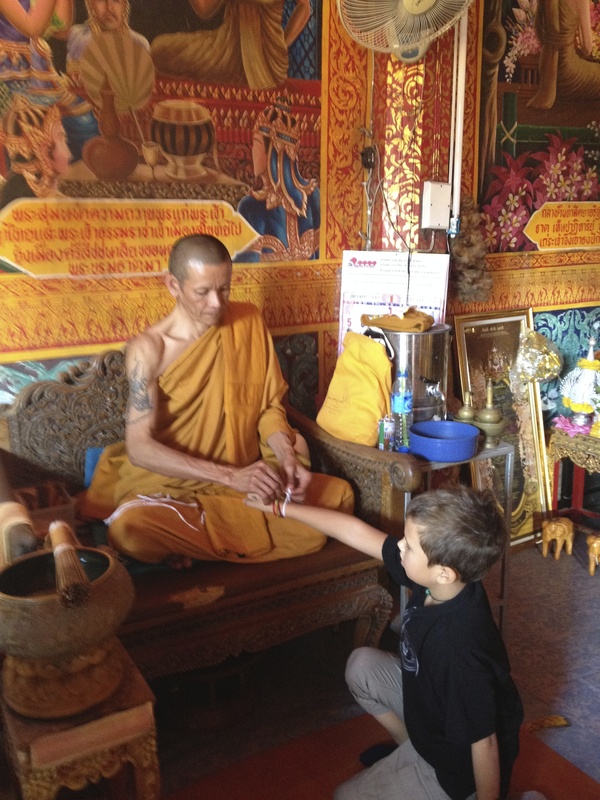 Even though they are not of the Buddhist faith, Emile and Filou were welcome to receive a blessing from one of the monks, and receive a string tied around their wrist for good luck (together with the monks’ blessings from Angkor Wat, Cambodia, they are gathering quite the collection of blessing bracelets!). 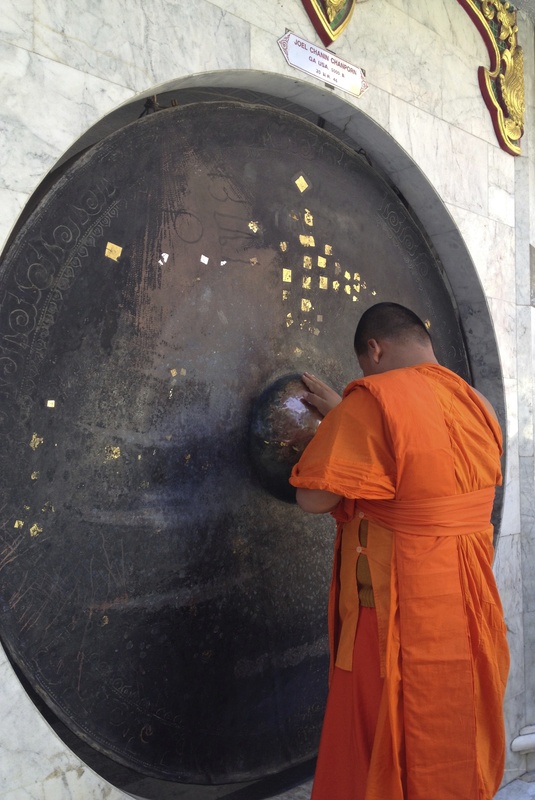 Also, my Dad had a lovely chat with one of the monks, who came to pray and rub a large bell for good luck. 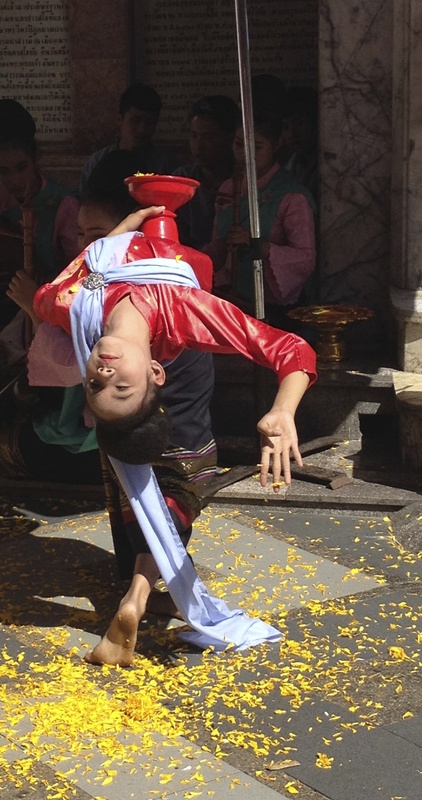 After enjoying some graceful, dance performances by beautiful Thai girls, we headed further up into the mountains. There are a number of different hill tribes living in Northern Thailand such as the Thins, Lawa, Karen and Meo for example. They live about 4-6 hours north of Chiang Mai in the mountains although several hill tribe tours are offered in and around town. Apparently those close by are Burmese refugees posing as tribal villagers so we weren’t going to engage in this kind of tourism– but the Meo Tribe Village happened to be close to the temple and the grandfathers thought it interesting, so we made a stop. 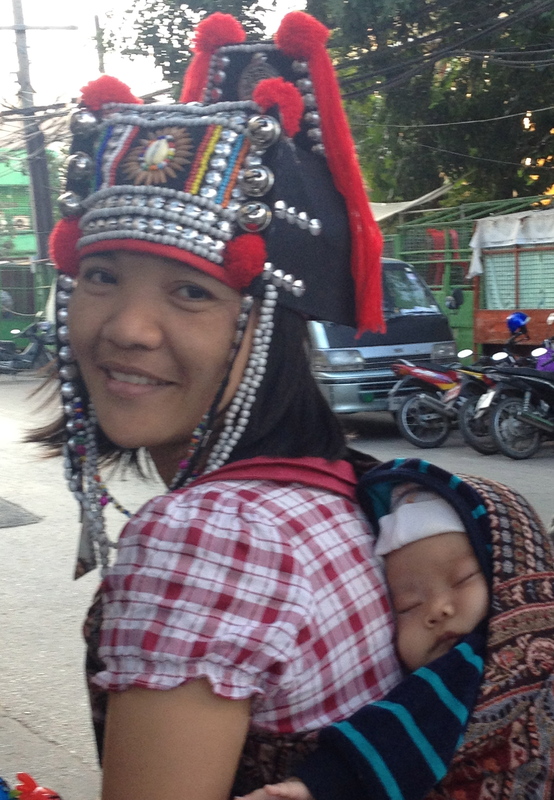 The Meo Tribe, also called Hmong come originally from Western China and claim their name from the word Mongol. Their village consisted of a large centre surrounded by several commercial areas, where they displayed their craftsmanship – mostly needlework and sewing, jewelry (fake diamonds and all) – and weaponry (bow and arrow). 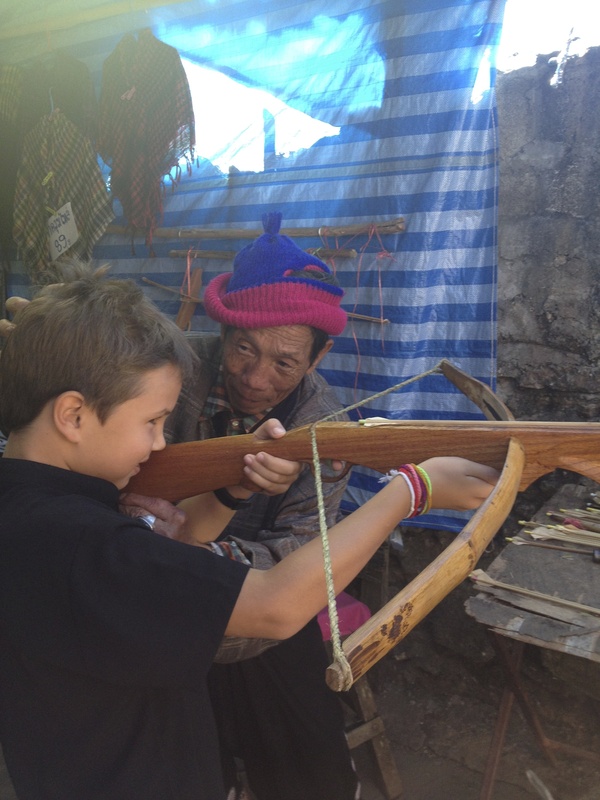 The boys enjoyed some archery, learning from the local experts and we visited the small Tribal museum where we learned about the history of these people. On top of the hill, in a large, beautiful garden – Thai tourists dressed up in Meo tribal costumes and took pictures of each other (and us with them!). 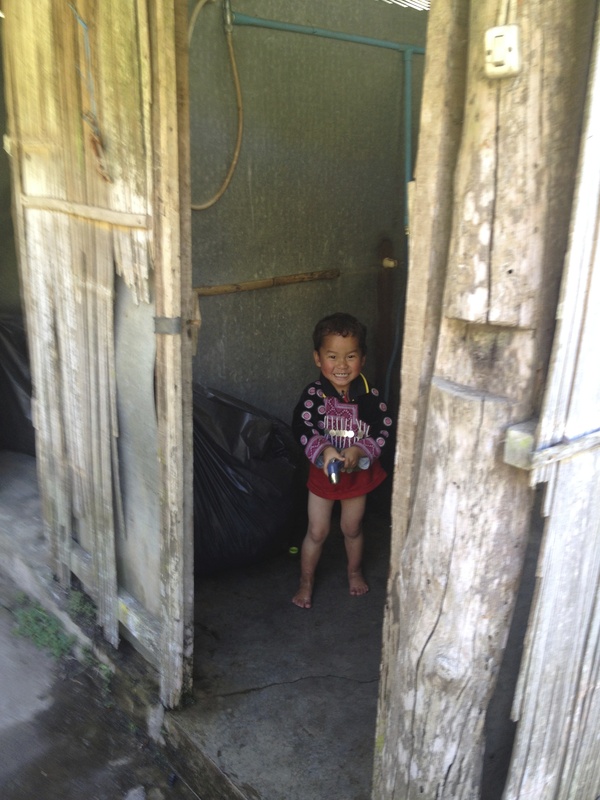 And little children in tribal costumes stole our hearts – especially the one in the bathroom that was trying to spray me with water as I was attempting to take a picture of him (who could blame him?). He was full of laughs till his mother came barging in and gave him heck! 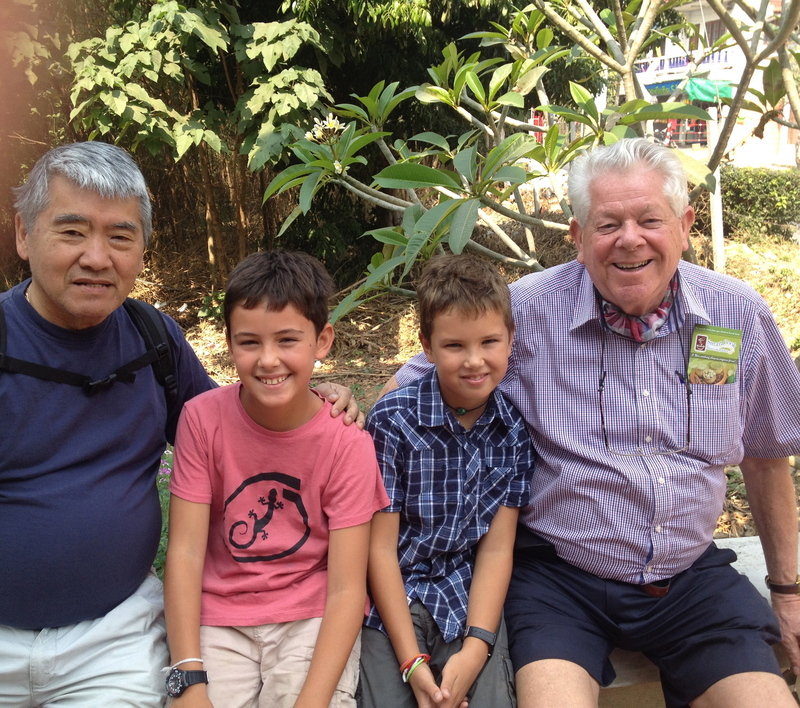 The boys also enjoyed some great times with the grandfathers at the Chiang Mai Zoo (http://www.chiangmaizoo.com), where they saw many colourful flamingos, hippos, giraffes as well as the amazingly beautiful white tiger and panda (we missed the pandas in China, so they were happy to have an opportunity to see one up close). 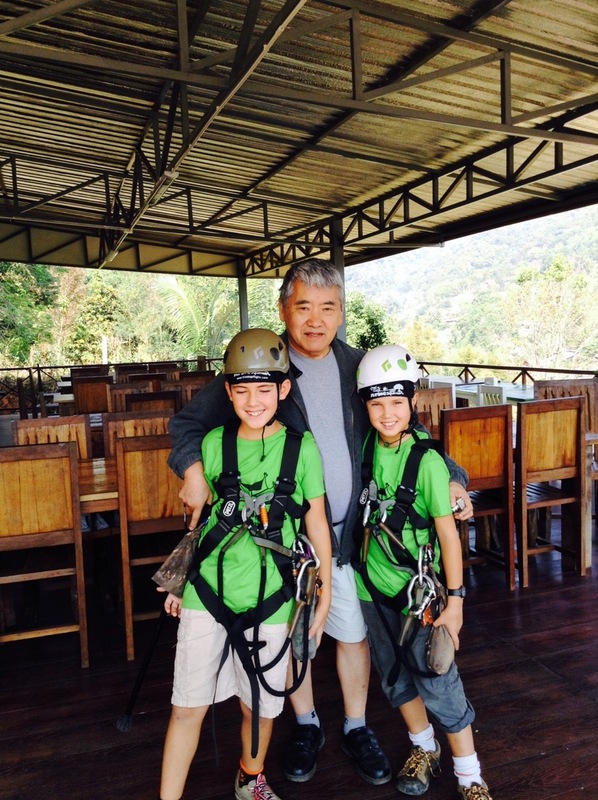 And Jichan was so nice to take the bus with the boys (45 minutes north-west of Chiang Mai), and go for a day of zip lining. With The Flying Squirrels (http://www.treetopflight.com), the boys had an absolute thrilling day of biking high in the sky, sliding down the trunk of a massive ancient tree and of course flying trough the tree tops. The longest zip line was about 600 metres – so long that they had to put the boys together in one harness to have enough weight to reach the other side! 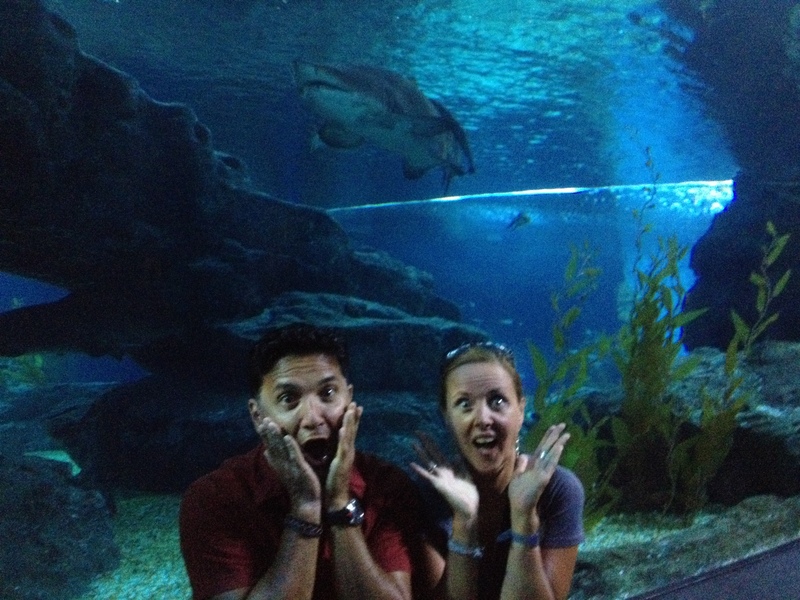 Of course, our daredevils loved every minute of this adventure! 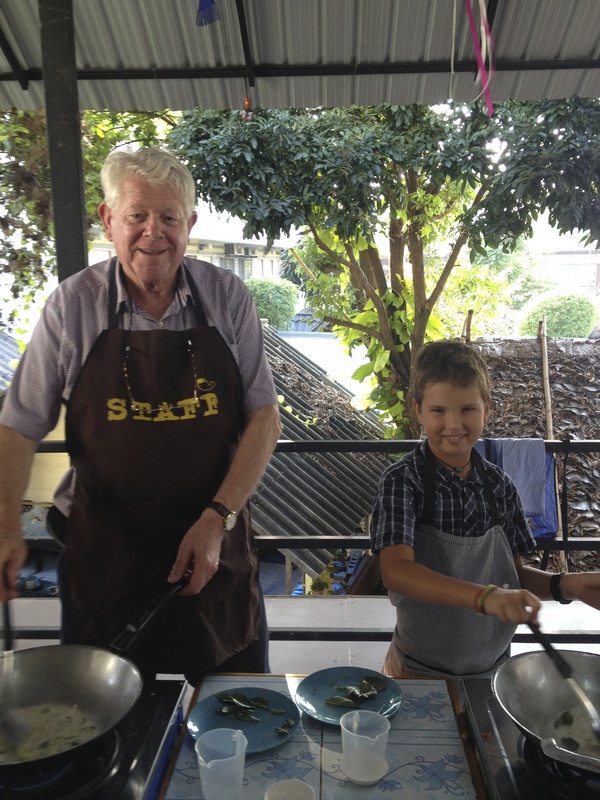 With Opa, Filou and I were happy to join in with an international group of backpackers and learn the unique style of Thai cooking. With Smart Cook (http://www.smartcookthailand.com) we learned to put together some delicious local dishes (as well as pick the ingredients from the nearby market) – from Coconut Milk Soup with Chicken to Pad Thai and Sticky Rice with Mango – it was all fun to make and scrumptious! Ps: Mam, make some room in the kitchen as your hubby is coming back with lots of enthusiasm, some local spices and a Thai cookbook in hand! While the grandfathers were having some one-on-one bonding time with their grandsons, Anthony and I took advantage, rented a scooter and ventured out to drive the Samoeng or Strawberry Loop; a 100KM rollicking circuit through the mountains of Chiang Mai (well-known by motorcycle and bike enthusiasts as it claims to be the best ride in Northern Thailand – in a region, known for its delicious strawberries!). Our first stop on this breathtaking ride through lush greenery was Doi Suthep-Pui National Park in which the well-known Mae Sa Waterfalls are located. Mae Sa are actually a series of 10 small waterfalls and cascades spaced anywhere from 100m to 500 m apart from each other. We hiked the winding road up the river and made it as far as level 5 – which was a great location for a rest, a chat and selfie on the bridge! From there, we stopped at the restaurant of the Pong Yang Ang Doi Resort (http://www.pongyangangdoi.com). This eating establishment is located high up, amidst lush greenery, overlooking the slopes of Pong Yang mountain. With a beautiful waterfall as our backdrop, this was a wonderful little find with incredible views! The food was pretty good too – I tried a banana flower salad that was really unique in taste. The next day, we did it again! 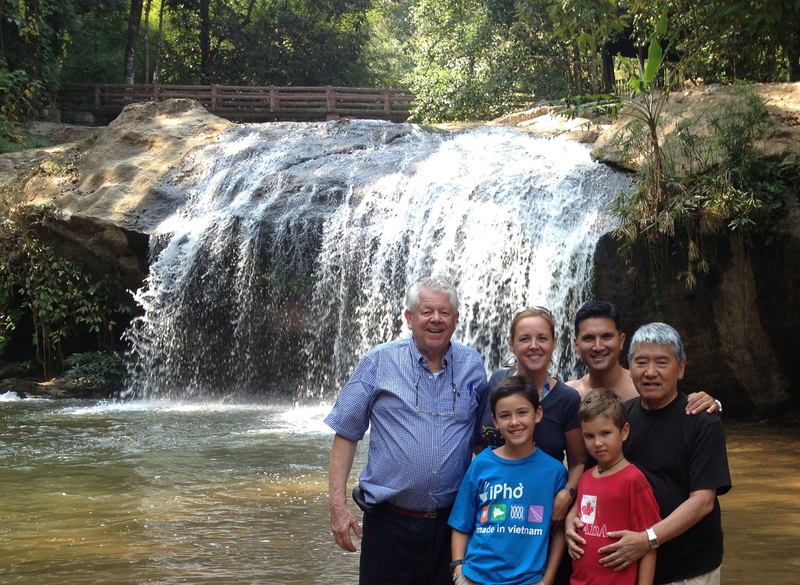 We took the whole family for a picnic lunch at the waterfalls and enjoyed the spectacular views at Pong Yang Ang Doi restaurant, while having a refreshing beverage. 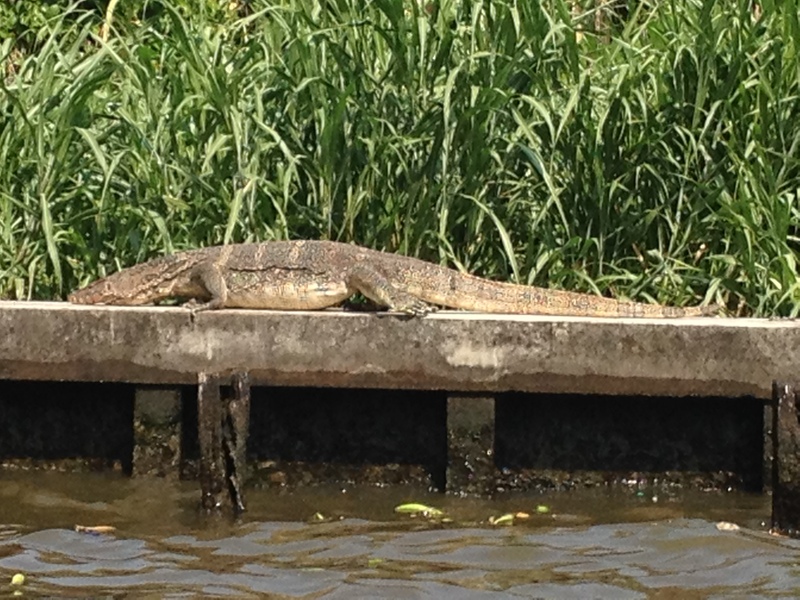 Ps: We also quickly saw a crocodile show, both to please the grandfathers and to instill a teaching moment. Emile was so taken by the animal cruelty (the animals looked like they were drugged and were pushed around and stepped on), he left crying within 5 minutes. We are proud of how he’s developing his critical thinking skills. So, after having enjoyed a multitude of great “adventures” with the grandfathers, it was time for one last Y.O.L.O experience. 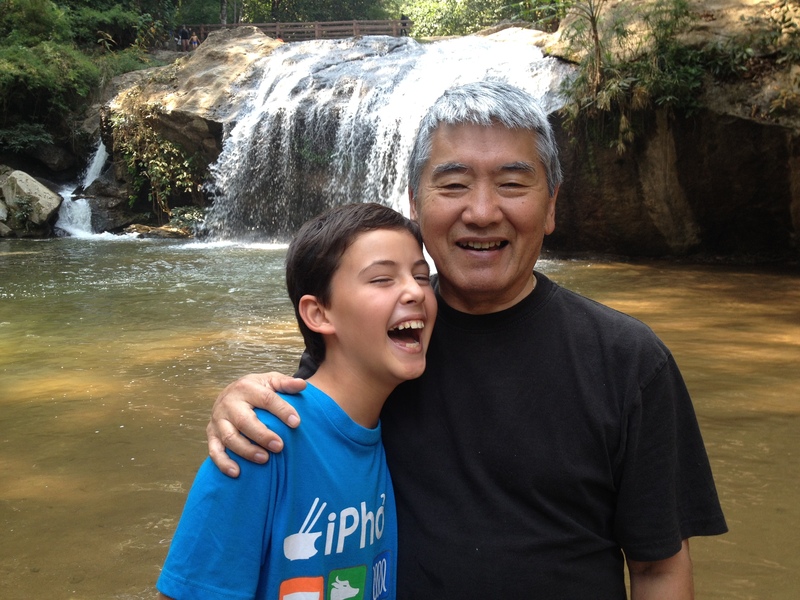 I took my Dad on a motorcycle ride through the back roads of Chiang Mai. Probably, not something he would ever do at home, but he LOVED it! En route we stopped at a beautiful estate (we are nosy and wanted to explore a little!) and found out that a Thai princess was living there with her family. 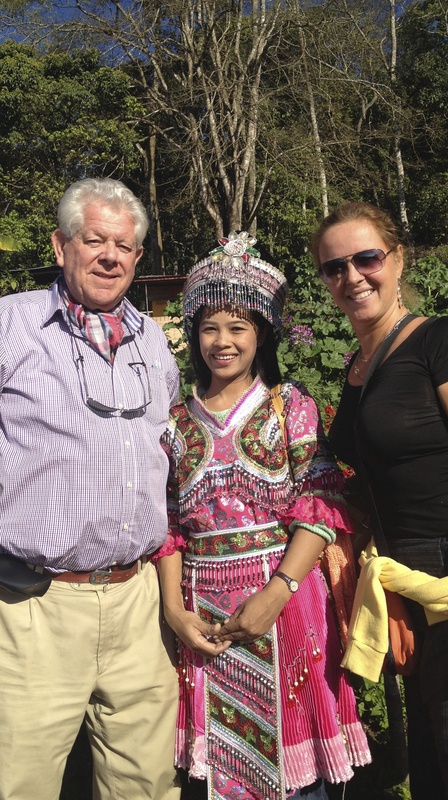 She had just given the rights to a British-Thai couple to open up an upscale restaurant on the property. It was gorgeous and I am sure they will do well. The owner was happy to chat with us and we enjoyed a delicious, complimentary coffee. It is these kinds of unique experiences that you have while touring around – and the exact reason why travelling and experiencing the world is so great! 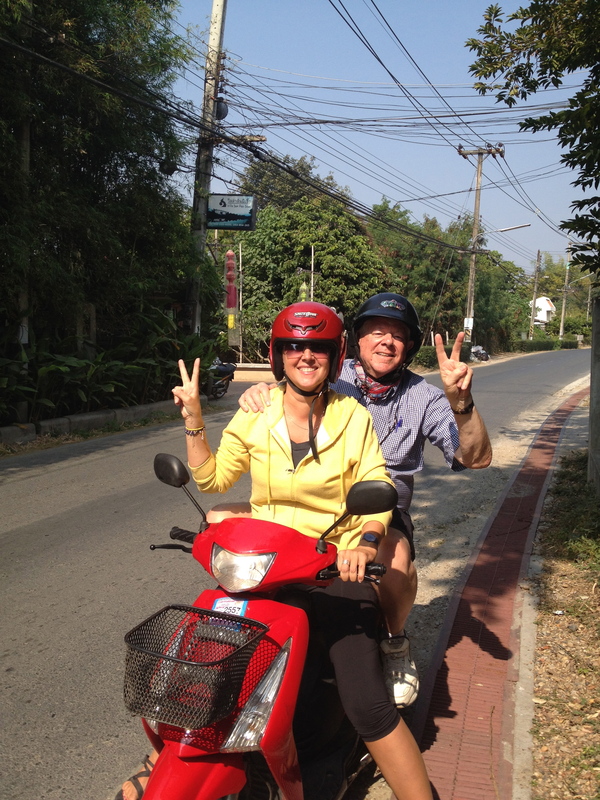 Cruising the back roads of Chiang Mai, with my 75-year old father on a motorbike. Y.O.L.O! It was amazing to share some of the incredible experiences we are having on our Regeneration Tour (http://the-regeneration.com), with our Dads-Granddads! Together we created some very dear memories! 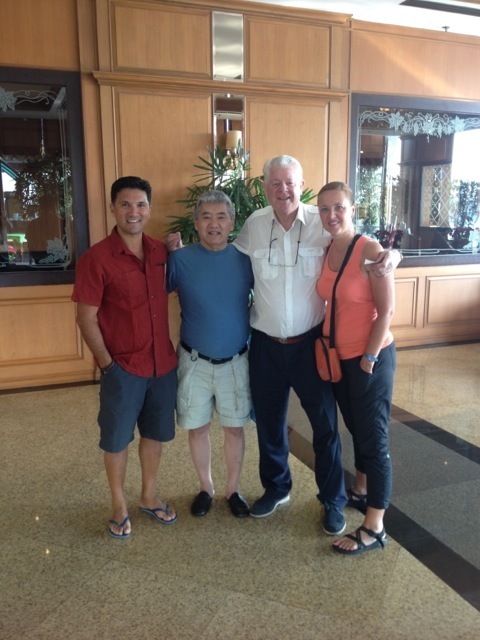 Thank you Opa and Jichan for your love, support, many laughs and great conversations. 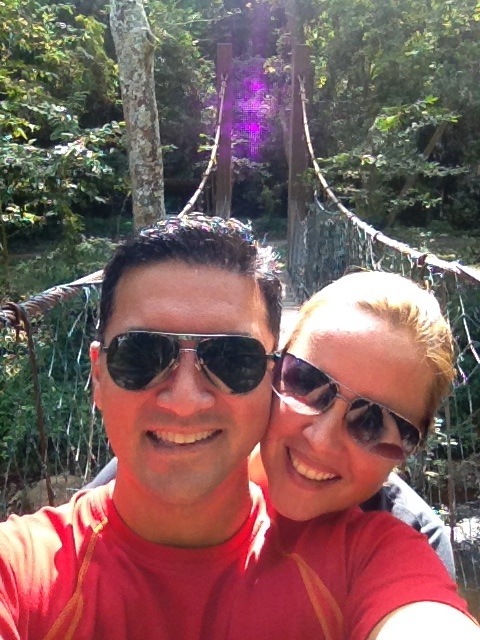 We had such a great time and will miss you both. Safe travels back home! 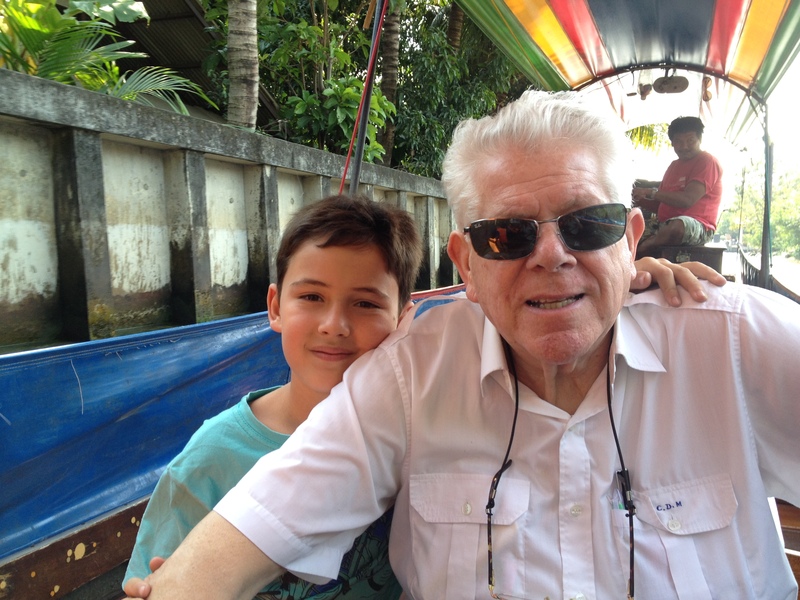 We will miss you Grandfathers….It was an incredible time of creating priceless memories together! And now it is time for some poop and scoop as we are off to the Elephant Nature Park for a week of volunteering.